It is never easy when children get cooped up inside for days on end. Siblings begin to bicker, children get bored and act out, and things get broken due to inappropriate rambunctious play. I know my children are much happier (and more pleasant to be around) when they can get outside every day. When that becomes impossible due to sickness or bad weather, the entire family suffers. 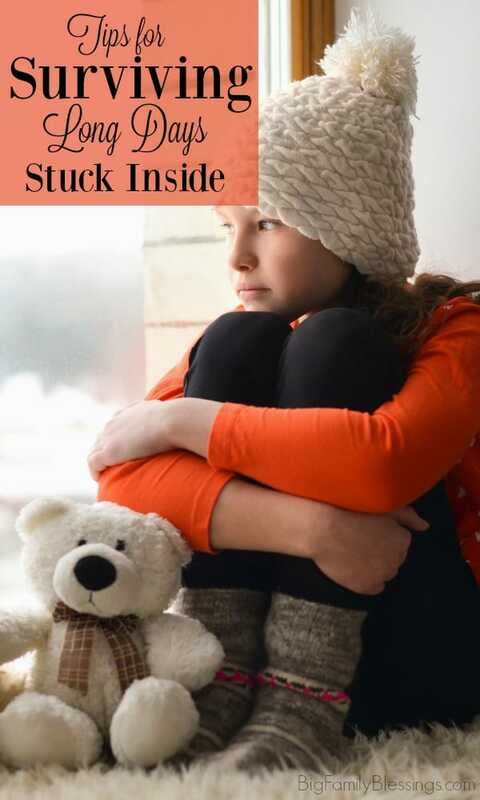 Whether you your family is stuck inside due to snow, bitter cold, rain, or sickness these tips will help your whole family survive those cooped up days. Set a timer. Rather than letting children get bored with an activity and turn to bickering, set a timer to change up activities every half hour or so. Be sure to end the activity while it is still fun. Vary activities. When you change activities, be sure to suggest activities that are different than the last one. Don’t group like activities together. Keep the day fun and moving along with lots of variety. Change from an active activity to a restful one, or from a creative activity to 30 minutes of electronics. Keep a list of activities on hand. Rather than scrambling for ideas keep a list of activities for long indoor days on hand. Keep a stash of new or special toys to be used only during those cooped up days. Play dough is my least favorite kid activity, but when we’ve been inside together for too many days it’s the perfect time to take the play dough from its hidden spot in the top of my closet. You can also keep a box of toys picked up on clearance for days like this. Be sure to find appropriate ways for children to get their wiggles out. Try balloon volleyball, have a dance party, or make a couch cushion obstacle course. Children need physical activity every day, even when they are stuck inside. I hope these simple tips for keeping kids happy and occupied on those inevitable long days cooped up inside help your family make it through the next cold or rainy day with little stress! How do you keep your kids from tearing down the house, and each other on cooped up days? Check out more posts with ideas for cold and rainy day activities: Independent Indoor Activities for Kids and Simple Rainy Day Activities.